Irene Junkuhn designed and stitched this stunning embroidery for Rajmahal using lustrous Art Silk thread and Gold Sadi metallic thread. A gorgeous addition to your home this summer. 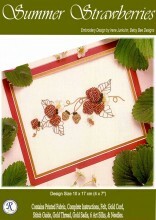 Contains Printed Fabric, Complete Instructions, Felt, Gold Cord, Stitch Guide, Gold Thread, Gold Sadis, 6 Art Silks, & Needles. Click the button below to add the Summer Strawberries to your wish list.